Troops of 112 Task Force Battalion of 22 Brigade deployed in Dikes, in furtherance of the ongoing clearance operation, on Thursday ambushed a group of Boko Haram terrorists. 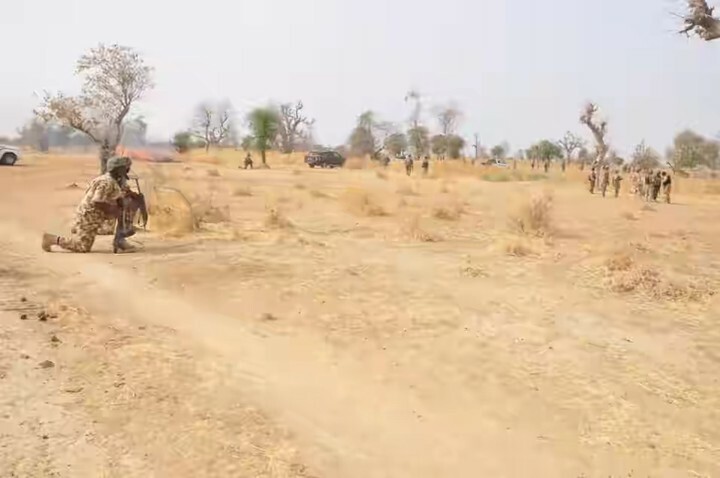 The terrorists were attempting to sneak into Sambisa forest through Lumda village, some few kilometres away from Maiduguri-Dikwa Road in Borno State. This is contained in a statement on Friday by Army spokesman, Brig. Gen. Sani Usman. He said the troops killed 3 of terrorists, while several others escaped with gunshot wounds. “The troops further recovered 5 bicycles, mechanic tools, sacks containing various items and some mosquito nets from the ambush site. “The public is please requested to remain vigilant and report suspicious movement of persons to security agencies”, it added.